UDAY Express is complete for roll-out! 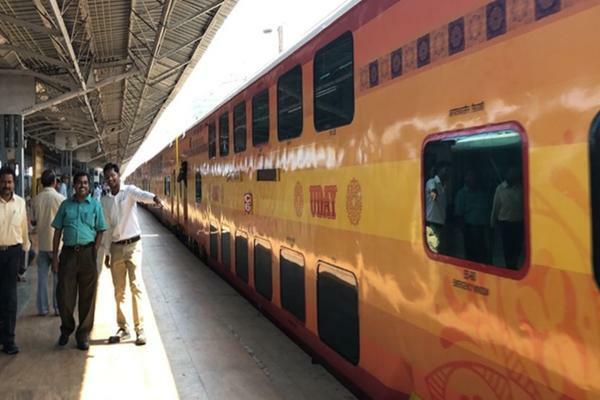 Indian Railways is all set to roll out its second UDAY Express of Utkrisht Double Decker Air Conditioned Yatri service. The new UDAY Express double-decker train has six AC chair car coaches with a seating capacity of 120 each. Furthermore, there are three AC Chair Cars with a mini pantry and seating area. These coaches can seat up to 104 passengers. Two power cars for the UDAY Express train are also ready. The new luxury double-decker train will also have a food and tea/coffee selling machine in each mini pantry. The train has also installed an LED screen in the storerooms and dining area for the entertainment of passengers. The seats in Uday Express is similar to those in the Shatabdi Express trains but with a red color pattern this time. The internal paneling of the coaches has a colorful anti-graffiti vinyl casing. Each coach has LCD screens to provide passenger information such as the next station, average speed etc. The exterior of the new UDAY Express train is very common to the first one, with a Tejas Express like the orange and yellow color scheme. Adding to the comfort of the passengers, the new double-decker train has used an air deferral system with many shock absorbers to ensure a smooth ride for passengers. Manufactured by Rail Coach Factory (RCF), Kapurtala, the UDAY Express train is equipped but will only start for public use after Lok Sabha elections 2019 owing to the Model Code of Conduct. Well, we are impressed by the efforts of the Indian Railways. Are you too? Marriage on Cards for Nargis Fakhri and Uday Chopra! First Run of Tejas Express Shows Us What We Really Are! Things to Expect When You Travel by the New Tejas Express. Mumbai train Stunt - Dangerous!